Once you’ve led S&OP/IBP change and established a good S&OP/IBP foundation, you want to sustain that level or continuous improve to get to advanced S&OP/IBP. After initial basic S&OP/IBP successes, which might have taken up to a year to accomplish, there is a danger that everything goes back to normal. The initial excitement and novelty of S&OP/IBP fades, people focus on new priorities and get a bit sluggish in believing in and adhering to the S&OP/IBP process. According to a recent Gartner publication, it takes up to 10 years to get to mastery in S&OP/IBP. In this timeframe key management positions might have changed two or three times. New strategies have been set several times and even mergers and acquisitions can happen. During these types of major business changes, it will be the underlying company culture that can survive these events and keep the focus on sustaining S&OP/IBP. If the company culture has no trusted and respectful environment that sustains important behavioural S&OP/IBP principles like open and honest communication, transparency, conflict resolution and coaching to improve, there is less chance you will have the time to get to S&OP/IBP mastery. There are examples of companies that were very successful in S&OP/IBP for some years and let the process deteriorate in months during and after a merger. The four types of S&OP/IBP leadership can both be lived inactively or actively. An S&OP/IBP ignorer can quietly dislike the S&OP/IBP process or choose to actively influence people that S&OP/IBP is not the right thing and try to derail the process. On the other side of the spectrum we can have a leader that quietly drives S&OP/IBP process and behaviours, or a leader that actively uses every opportunity to advocate the S&OP/IBP behaviours and communicates process results and improvements to the wider business. The different types of S&OP/IBP support will be explained with some examples. This leader type doesn’t like or want S&OP/IBP. He or she might have different priorities or feel threatened by clear processes and transparency. This type doesn’t show the S&OP/IBP behaviours and personal values and behaviours might even be on the opposite side of the S&OP/IBP behavioural spectrum. This leader might prefer a command and control management style, keeps information within the functional silo and might talk other people down to get their way. Constructive feedback or coaching to improve are not common practices this leader type shows. Most of us can imagine an active S&OP/IBP ignorer in meetings. Arms folded, shaking the head with every new slide, making negative comments about the content and show aggressive defensive behaviour when discussing matters to come to consensus. Use of smoke and mirrors when discussion functional performance. This person is likely to be in the 30% of natural non co-operators. If there is critical mass of leaders in this quadrant, S&OP/IBP is not likely to become an effective executive meeting. A sustainable S&OP/IBP culture, based on principle behaviours, will almost be impossible to establish. Limit your focus in this part of the quadrant. This leader type understands the importance of the S&OP/IBP process and S&OP/IBP content, but doesn’t necessarily behave according to S&OP/IBP principles. This type has a positive influence on the S&OP/IBP process itself, creates S&OP/IBP awareness, but doesn’t necessarily create a sustainable S&OP/IBP culture. An example of a passive S&OP ignorer is when I worked as supply chain manager at a beverage company. In my first interview with the managing director he mentioned that he sponsored the companies S&OP process. Only later I realized that it was the only time I actually heard him use the S&OP abbreviation. He did not support the S&OP process. Furthermore his behaviours didn’t show transparency and collaboration, he was an inactive S&OP ignorer. I started up an S&OP process, with collaborative forecasting with two of the fifty countries we were exporting to. Monthly forecast accuracy increased on monthly level from 40% to 70% for those countries, but after the demand and supply review the S&OP information never came to the boardroom for decision making. S&OP stayed at demand and supply planning without sales having the full ownership for forecasting. When a new managing director came in who had experience with S&OP things changed quickly for the better. Within months the company was running a decent S&OP process. There was sales owned collaborative forecasting with most of the major countries, finance was involved and S&OP became a boardroom meeting, where decisions were being made. This is the difference an S&OP supporter on executive level can make versus an S&OP ignorer. Be aware that S&OP/IBP process supporters can be highly knowledgeable in S&OP/IBP and enabling technologies. They just might not have the behavioural capacity to create a sustainable S&OP/IBP culture. I experienced a highly knowledgeable S&OP/IBP manager who when we first met told me all about how I had my own responsibility and how trust was granted to me as long as I delivered against our agreed objectives. After telling me all of this, the first thing this leader did was to put two weekly meetings in my calendar. One meeting for Tuesday to review the results for last week and one meeting for Thursday to discuss the working plan for next week. This S&OP/IBP process supporter talked about creating a trusted and respectful environment, but the behaviour I perceived was exactly the opposite; distrust and controlling. Under this type of leadership S&OP/IBP can work, but will never be effective in the long run. No sustainable S&OP/IBP culture will be created, unless behaviour changes. Through this type of leadership S&OP/IBP stakeholders will be less engaged and not perform to their best. Information will not openly flow across functions and cross functional coaching and learning will not flourish. People will not go the extra mile to continuously improve. A culture under which best practice S&OP/IBP is not likely to be reached. In this part of the quadrant, there is an opportunity to get to S&OP/IBP leadership if you focus on improving the S&OP/IBP culture by addressing behavioural issues. Maybe this leader type doesn’t understand or ‘get’ S&OP/IBP, but shows S&OP/IBP behaviours and might even advocate these as part of personal values. This type naturally works across functions, shares information openly, empowers their people and coaches to improve. Cherish these types of leaders, as they can be the cornerstone to build your S&OP/IBP process. They can help you address behavioural issues on boardroom level. I vividly remember an S&OP/IBP cultural supporter. It was the introduction speech from a CEO who had the task off merging two multi billion dollar food companies. In his first speech in front of the total head office of the soon to be acquired company he dared to relate the ten-year success of his company, in terms of increased sales and shareholder value, directly to the ten-year cultural growth. The previously dominant culture of aggressive-assertive and passive-defensive behaviour has been changed to positive collaborative behaviour thanks to a cultural awareness programme. The employees are now better at sharing information and collaborating, and are much more enthusiastic about the company and its brands. This CEO also said: ‘If you don’t perform, but fit our new culture, we have to ask you to leave. If you do perform well, but you don’t fit our new culture, we have to ask you to leave too’. It is clear that this CEO wanted to sustain his positive, collaborative and achieving company culture. Although this CEO might not be aware of S&OP/IBP processes and technologies, his company culture forms a strong basis on which S&OP/IBP can flourish. In this part of the quadrant, focus on S&OP/IBP eduction with these leaders and explain what’s in it for them and for the total business. This can transform them in S&OP/IBP leaders. This leader type understands the importance and supports the S&OP/IBP process and the related behaviours. This type strongly believes and advocates that S&OP/IBP is the way we do business and S&OP/IBP behaviours are the way we behave. This leader proactively engages and coaches to improve across functional boundaries, is disciplined in the S&OP/IBP process, advocates transparency and stays constructive, even in conflict. We can expect the S&OP/IBP manager to be in this bucket. Unfortunately in almost 15 years of S&OP/IBP experience I only came across a handful of S&OP/IBP leaders. One of them even got made redundant and replaced by an S&OP/IBP process supporter. A reminder that real S&OP/IBP leadership is rare and can only excel in environments that embrace and stimulate this type of leadership. 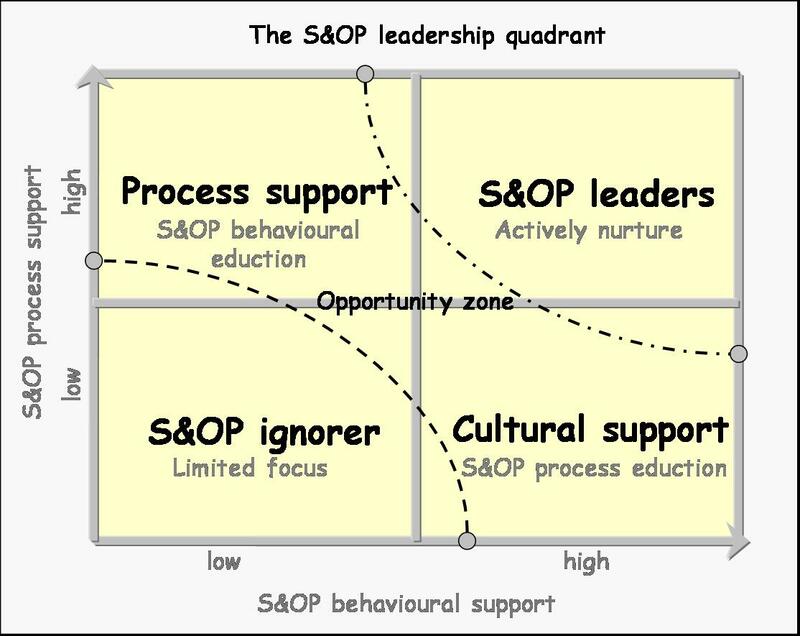 If you have senior leaders in this part of the quadrant, focus on actively nurturing your S&OP/IBP process and culture with these senior leaders. Build partnerships: focus to actively build relations with process and behavioural supporters on executive level. Ask process supporters to become active and influence other leaders on the importance of the S&OP/IBP process. Build partnerships on senior level with leaders that support S&OP/IBP behaviours. Ask them to become active advocates. These senior leaders can help to put S&OP/IBP principle behaviour on the boardroom agenda. S&OP/IBP vision: start at the top and create an S&OP/IBP vision that is aligned with the company vision. Make sure S&OP/IBP principle behaviours like ‘pro actively engage across functions’, ‘be open and transparent’ or ‘lead in meeting disciplines’ are linked to the company values. In this way you can always refer back to the fact that ‘this is the way we’re doing things here and this is how we behave’. Add the principle behaviours you define as an appendix to the monthly S&OP deck. Hire, develop, promote or let go: if a business is committed that S&OP/IBP is the way to do business and S&OP/IBP behaviours are key in the company culture, this should be reflected in HR policies. Make sure that the next generation of (top) management really does personify the new S&OP/IBP approach. This is about hiring, promoting and developing employees who support and practice S&OP/IBP process and behaviours. The ones who don’t; let them go. In this way we can make sure the right people end up in critical S&OP/IBP positions and that the new leaders will personify S&OP/IBP and sustain the S&OP/IBP culture. Advocate: Lead by example in S&OP/IBP process and behaviours. Actively build trust by asking for feedback on your own S&OP/IBP behaviours or share your development plans with your team or your peers. In team meetings, give examples of behavioural improvement opportunities you discovered about yourself during the S&OP/IBP cycle. Be disciplined in sticking to meeting timings and agenda’s, show passion to collaborate across functions, share your S&OP/IBP knowledge and stay constructive at all times. Measure: make S&OP/IBP behaviours measurable. S&OP/IBP can be added to cross functional curriculum, induction, training, and 360 degrees feedback and performance programs. S&OP/IBP engagement can be measured through the company’s yearly engagement survey. Communicate: Make a conscious attempt to show people how the S&OP/IBP process and behaviours have helped improve visibility and performance. This is about communicating the wins of S&OP/IBP to key stakeholders or to the total business. Senior leaders and managers can monthly update their wider functional teams of S&OP/IBP outcomes, small wins and good S&OP/IBP behaviour. Face to face and with the support of the company newsletter. In the monthly S&OP/IBP cycle, good examples and improvement opportunities can be reviewed and discussed as part of continuous S&OP/IBP improvement. When you have established critical mass in the S&OP leadership quadrant you will start to create an effective and sustainable S&OP/IBP culture. Cherish and nurture it and keep making sure you get the behavioural as well as the process support from the senior leaders. Don’t forget to celebrate as you’re one of the few who made it this far! The next leadership challenge waits when you start implementing your S&OP/IBP process across geographies. My next blog will focus on some aspects of that.